Buy Makeup Studio Fixing Spray online at Boozyshop, the makeup webshop! You know the feeling that you did your best in the morning to make the perfect make-up look, then you look in the mirror in the afternoon and you do not see it anymore! That's a bummer. But that is not necessary! Because with the right fixing spray your make-up is fleck all day long! No more unnecessary touch ups, no stress about whether your make-up is still good mid-day. And really, the Makeup Studio Fixing Sprays are true lifesavers! Choose the right fixing spray for your look and shine all day long! With the Makeup Studio Dé & Pré fixing sprays your make-up stays perfect all day long. The formula ensures that the oil production of the skin is slowed down and has a super nice, matte finish. Moreover, the fixing spray ensures that your make-up will not hide in your pores and fine lines, making you look smooth all day long. 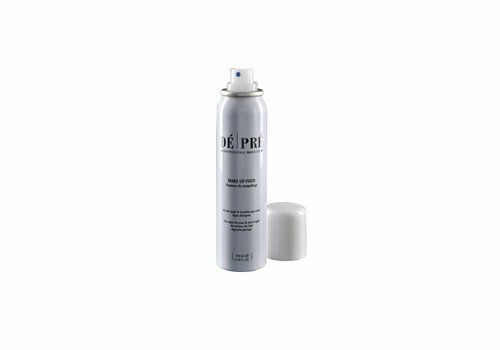 You can choose between the regular version and the waterproof version of the Dé & Pré fixing spray! Does your eyeshadow also remain so difficult sometimes? No problem; the Makeup Studio Seal It helps you to keep your eye look super long! Add this formula to your eyeshadow - both loose and pressed eyeshadow is possible - and then enjoy an eyelook that stays in place for a long time! It even survives a wonderful night out, so the Makeup Studio Seal It is an absolute must-have in your make-up stash! Buy Makeup Studio Fixing Spray? Order now at Boozyshop! Are you ready to look dazzling all day long? Nice, because the fixing sprays from Makeup Studio are ready to be dropped in your shopping basket! Extra nice: you get a gift for orders from € 30. Let's gooooo!